Hi! My name is Alona, and I am 11 years old. I have a dog, and one sister. My favorite book series is Warrior Cats, by Erin Hunter. I love to read, I also love to draw, write books, and role-play online. In writing my 32 page report about keeping snakes as pets, I came across a lot of information. The information was pretty contradicting at times, and it took work to figure out which sources to believe and which sources to disregard. I’ve found that this isn’t just true about pet snakes; it’s even truer when it comes to wild snakes both venomous and non-venomous. There are a few misconceptions that I want to address before we get started. Snakes are poisonous. No! Snakes are not poisonous. Poison must be eaten. Venom is injected into the bloodstream. 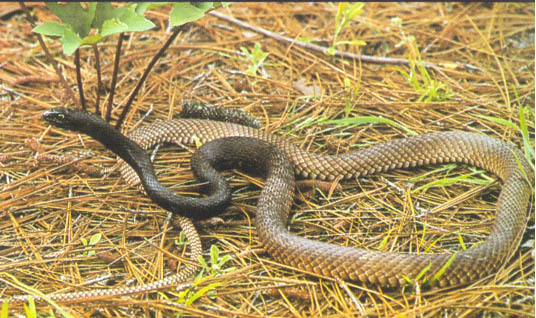 Copperheads and other dangerous snakes are venomous because they inject their venom into their victim’s bloodstream. Cat-like pupils mean venomous. Nope. There are plenty of nonvenomous snakes, including ones kept as beginner pets, that have this kind of pupil. Round pupils mean nonvenomous. Also incorrect. While this may be true for some nonvenomous snakes, a copperhead’s pupil will dilate in low lighting. Pupil is no reliable indicator of anything. Triangle head shape means venomous. Incorrect. 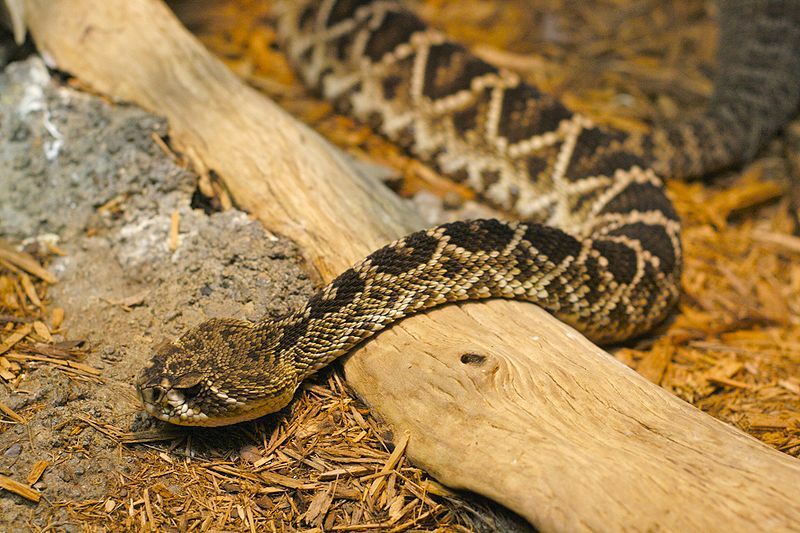 Many nonvenomous snakes will flatten their heads to look triangular when threatened. Remember that the best way to know if a snake is venomous or not is to memorize what your local venomous snakes look like. If the snake you want to identify doesn’t look like any of them, you’re probably dealing with a nonvenomous snake. We have only three venomous snakes, so I’m sure you can remember what they look like. 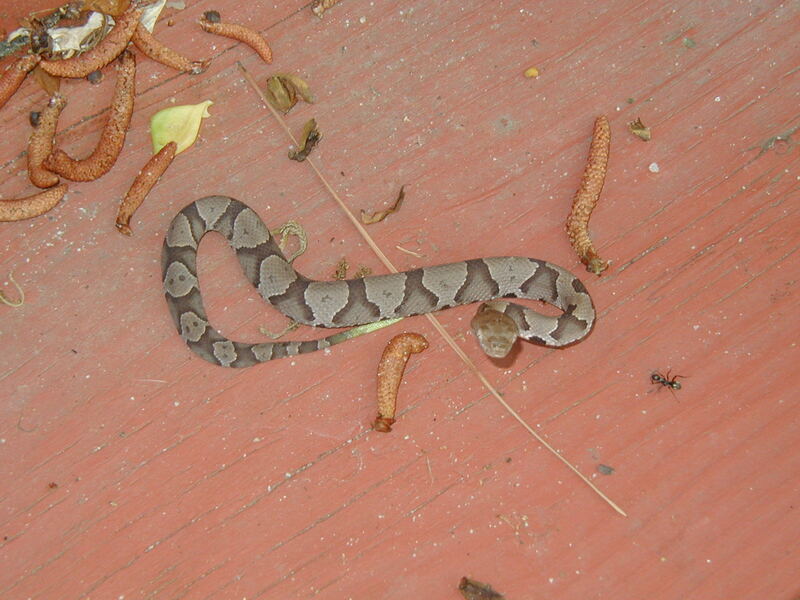 This is an adult copperhead. Adults are usually 2-4 feet in length. 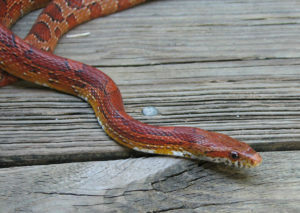 Notice that the head is a copper color and the body is copper and almost pink. The markings along the side of the body are Hershey kiss shaped (although some in other areas may have bands across their back and no clear Hershey kiss shapes). Copperheads are venomous. You do not want to mess with a copperhead. Instead, if you see one just leave it alone. If you really need to move it spray it with a hose. 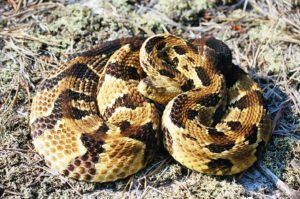 It is extremely dangerous to attempt to kill any venomous snake because that puts you in a much larger risk of being bitten than just leaving it alone. 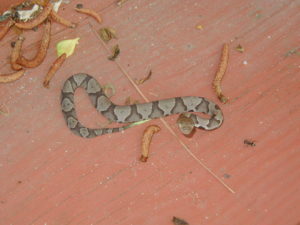 Below is a baby copperhead. It has the same markings as the adults and a bright yellow tail tip. 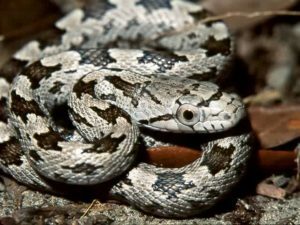 There is a myth that baby snakes’ venom is more harmful than adult venom, but there isn’t any proof of this. This is an adult timber rattlesnake. They are venomous and usually get about 3-6 feet. You can see the orange stripe that runs from the neck down the back. 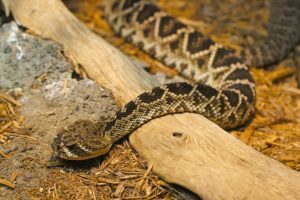 Like any other venomous snake, you should avoid getting too close. Give them space and they will move on with their day. 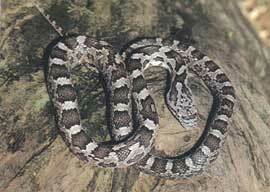 Below is a baby timber rattlesnake. 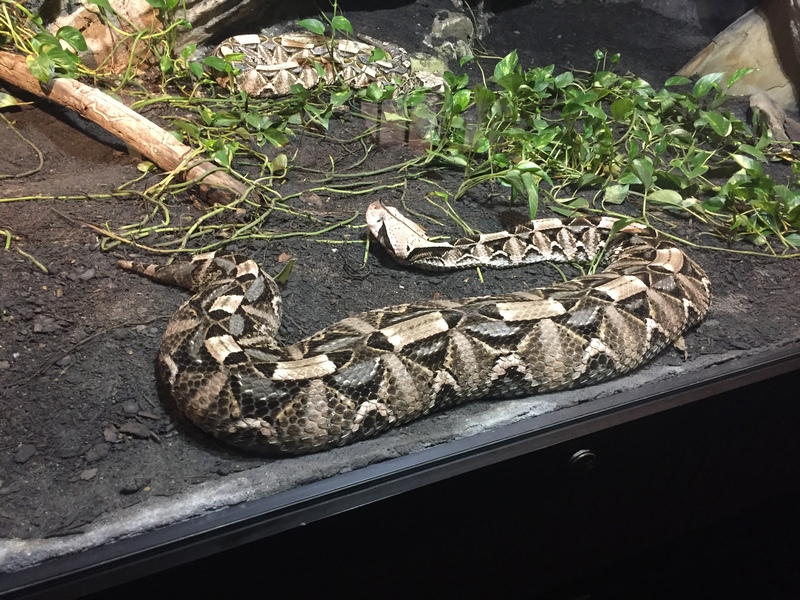 This is a venomous eastern diamondback rattlesnake. Some maps say that they are around here and others say that they aren’t, but I figured I would include it. There are diamonds down the back and it has a pretty distinct head shape. They get 3.5-6.5 feet long. Definitely respect these and give them space. Keep in mind that this list is comprised of 3 snakes. If you live in or around Charlotte and see a snake that doesn’t look like any of these, it’s probably safe, but don’t mess with any snake when you aren’t positive of the species. These are all non-venomous rat snakes. I think that they are so cute! They can be 3-8 feet long, depending on the species. 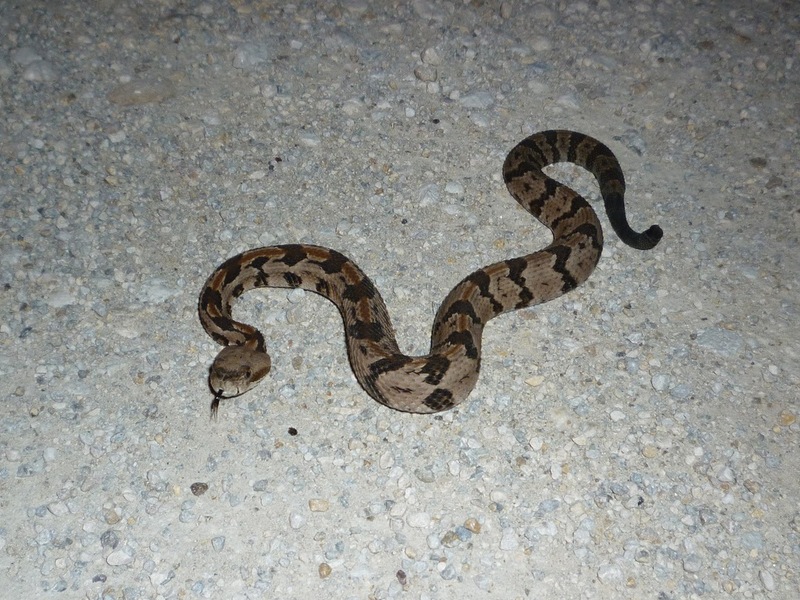 For some reason rat snakes are often misidentified as copperheads which… Makes no sense to me. But whatever. They actually feed on copperheads among other things. If you come across one please leave it alone! They will move along and eat the mice trying to get into your basement. If you really do need it gone you can spray it with a hose or, if you’re gutsy, you could gently move it by hand. If they do bite it usually isn’t a big deal. Wash super well and you’re good to go. Just make sure you know what you’re handling before you handle it! 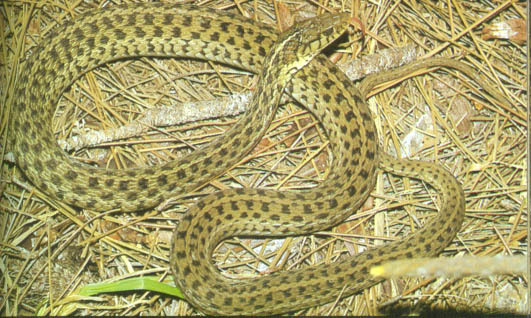 Eastern coachwhips can get up to 8.5 feet, but are usually more like 6-7 feet when fully grown. 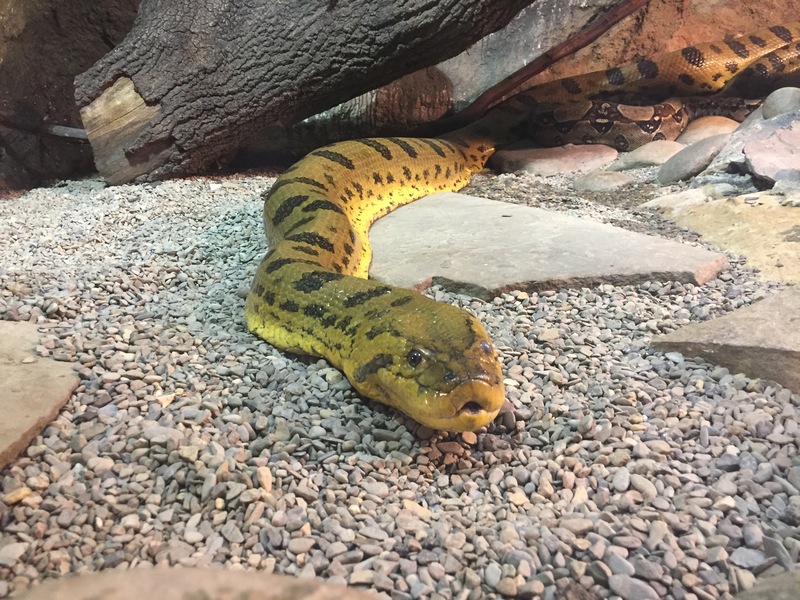 They are nonvenomous, but they are easily scared and will bite if cornered or threatened. I would avoid trying to come up close to these for the sole reason that they tend to bite one after the other and their bites aren’t enjoyable. 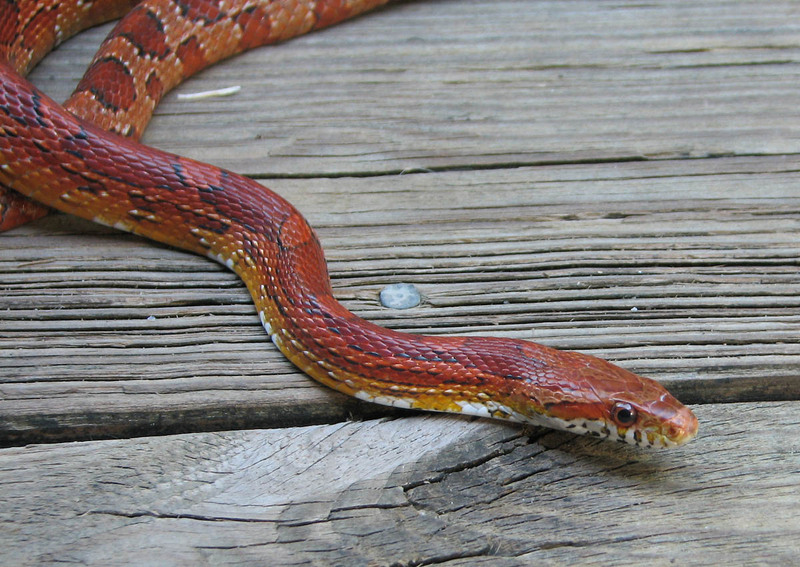 Corn snakes are extremely popular pet snakes because of their docile personality and easy care. They are nonvenomous and won’t bother you if you don’t bother them. They can reach 4-5.5 feet. They’re similar to rat snakes in that, if you want to, they won’t do too much to you if you try to move them somewhere else. These two are both nonvenomous garter snakes. 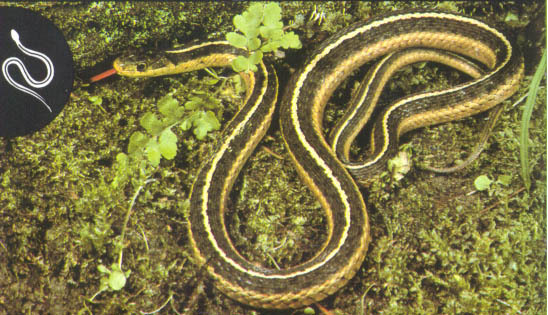 The top one is an eastern garter snake and the bottom one is a striped garter snake. These snakes can be 18-51 inches fully grown. They are harmless and great to have around your garden. I’ve seen three of these in my neighborhood this year! People usually think that they are babies, but these adults only reach 12 inches long. They are brown colored (sometimes a bit lighter brown than what these pictures show) with little dots going down their back. They are completely harmless. Their mouths are so small they can’t really bite you at all. In my experience, if they see you they will escape into grass or under pine needles. There are many kinds of harmless snakes in in my area not included in this post. Always use caution when dealing with wild snakes. Be smart and realize that they have just as much right to be there as you do. Killing snakes puts you in a lot more danger of being bitten than just leaving them alone. I suggest joining the group titled “Snake Identification” on Facebook. 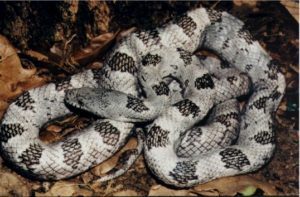 You can have professionals identify the snake you post within minutes, and you learn a ton from just seeing the posts. Thank you for reading! I hope you have a new appreciation and understanding of snakes. Feel free to comment and ask me any questions you may have! Last week was our second spring break. I went to drivers’ ed Monday-Thursday from 8am-2pm. This was my first real experience in a classroom and I actually loved it. My mom has always said that I would do great in a public school if I needed to attend one for some reason, and after my experience I’m sure that I would. I know that drivers’ ed is different in some aspects from public school, but I think the general idea is the same. We learned about tons of things. We learned about what the different fluids in the car do, the illegal per se law, how deductibles and premiums work, and how to get out of a skid. My teacher, Miss Veronica, was so hilarious. She made all kinds of jokes and she had an unlimited supply of old fashioned peppermints that we could get anytime. 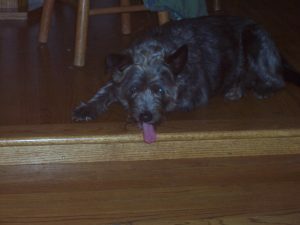 We also learned about her family history and the variety of times she had been hit by cars and in near-death situations. On Thursday we took our written test. We had two hours to answer 200 questions. I finished in a little over an hour. I was torn in between feeling super confident and feeling super nervous. After lunch we got the results. I passed with a 91! I had the fifth highest score in the class of probably 25 students. I felt really proud of myself, especially because the learning was so different from what I was used to. I noticed that nobody else ever asked questions, and I asked a lot of them. I wonder if that had something to do with my schooling versus theirs or if it’s just a coincidence. In the state of North Carolina you do thirty hours of classroom time and six hours of driving with an instructor before getting your permit. 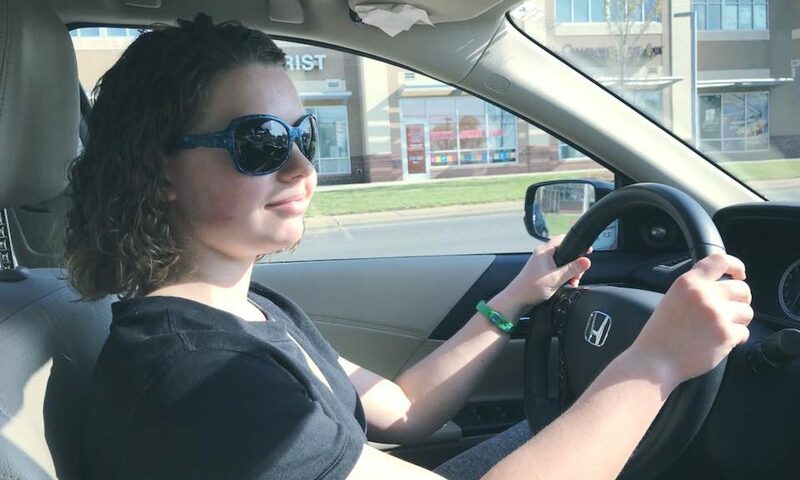 I thought I would need to wait a month before getting my first three hours of driving done, but I was able to do my first three hours on Monday (school started on Tuesday) and my last three hours after school on Tuesday. My instructor is named Paul. He is also very nice and very calm. He said I got an A+ after my first day. My second day I drove on I-485, which is the interstate highway that circles Uptown Charlotte. Today before school my mom and I went to the DMV and I got my permit! I had to take a vision test, road sign test, and a 25 question test. You are allowed to get 5/25 wrong on the test, but I got every single one right so the test cut short once I reached 20 correct answers. I drove home from the DMV and I drove my mom and sister ( @animalfreak9 ) to school. I’m so excited to be able to drive! Also… I’m getting a snake! My mom said yes! I’m planning to get a western hognose this August or September. If you or someone you know has a hognose and has any tips, please let me know through the comments! Last week I finished my report about snakes! I wrote 31 pages (the requirement was 30 pages) single spaced and included pictures. I wrote it so that I could have a conversation with my mom about me getting a snake. She said that she would read it today so I don’t know what will come out of it, but I really hope that I like the outcome. I’ve been working on it for six weeks and I think I spent around 50 hours working on it. 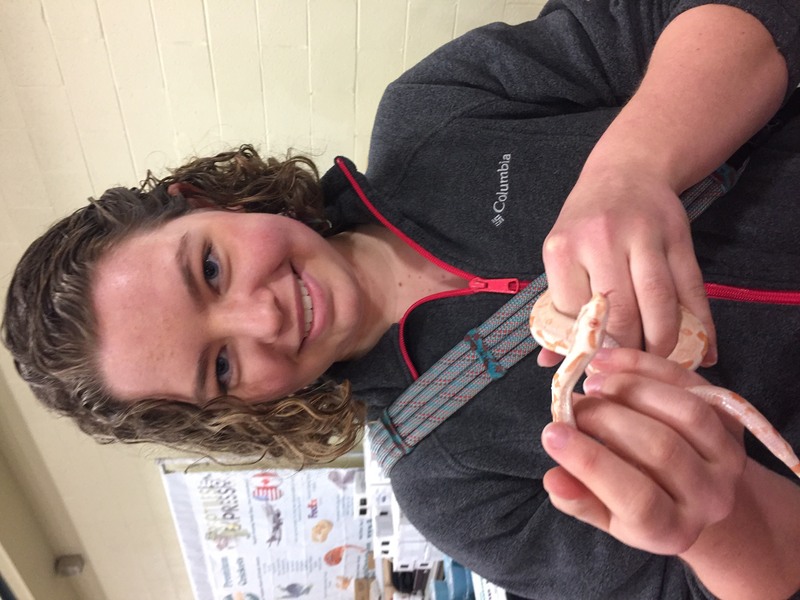 If she says yes, then my current plan is that I will get a western hognose snake sometime in August or September after all of my summer trips are over. Click HERE to read my report yourself. Please feel free to comment on this blog post and make any suggestions or reflections about it. Thanks! 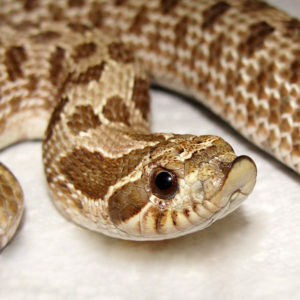 This is a western hognose. They are the cutest things in the world. Google “western hognose playing dead” and watch a video. Do it. Lately I’ve gotten really interested in snakes. 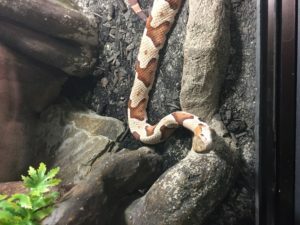 Our school is getting a snake named Ratters soon. Right now he lives with Jess until we have a cage for him (which she’s building). Since holding him and Jess and Zack’s other snakes a couple months ago I’ve been to a serpentarium (click to see my post about this trip) and Repticon. After Repticon I asked my mom what it would take to for me to be able to have a snake, and she told me to write a thirty page report about snakes addressing the pros and cons of having a snake, as well as how to take care of them and keep yourself safe whilst doing so. I’ve been working on it for a couple of weeks (including over spring break in Universal) and I’m a quarter to a third of the way through depending on how you look at it. So far I’ve written about rosy boas and I’m in the middle of writing about Pueblan milk snakes. 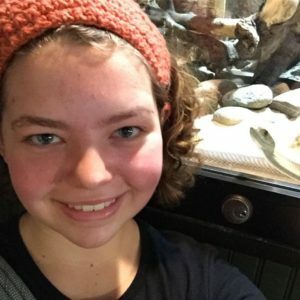 I’ve explored how to care for the individual snakes in regards to food, water, heat, humidity, the enclosure they’re in, and shedding. 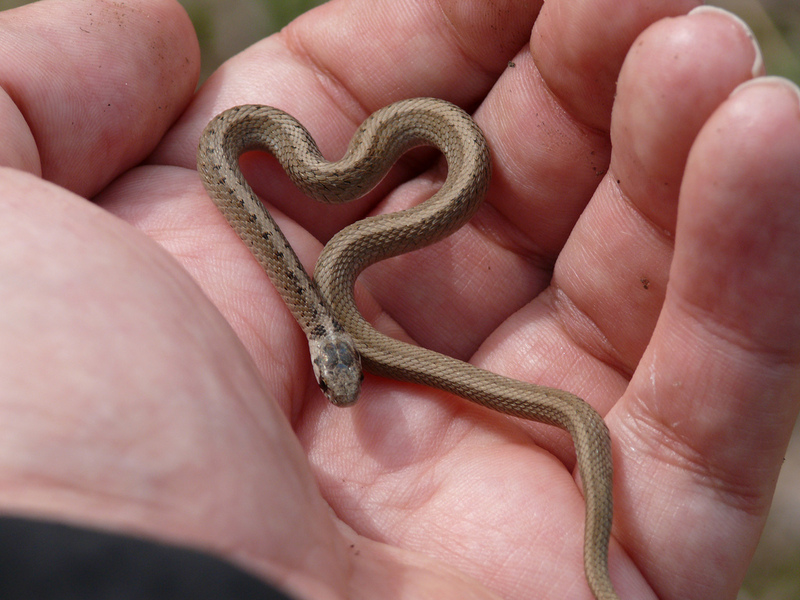 Every kind of snake is so different in the care that they need! Rosy boas shouldn’t have too much access to water in case their cage gets too humid, but Pueblan milk snakes should have a water bowl big enough for them to soak in at all times. 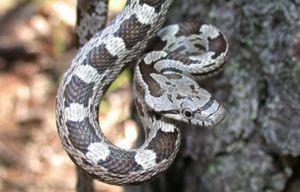 Here’s what I wrote about rosy boas. Please let me know if I’m missing things, any information isn’t totally correct, or if you have experience with snakes and/or other reptiles. Distinguishing fact versus fiction with online information is hard, especially when I come across wildly varying articles and blog posts. 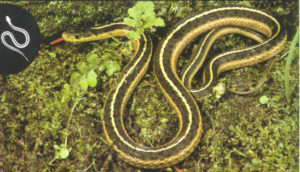 This is the rosy boa. They can come in many different colors including, but not limited to, rosy pink, salmon, orange, brown, gray, white, and black. They are easily identifiable by the three stripes down their backs. Rosy boas are are considered excellent beginner snakes for many reasons. They are easy to find because of their popularity and they are not expensive. You can get a Rosy boa for as little as 25 dollars. 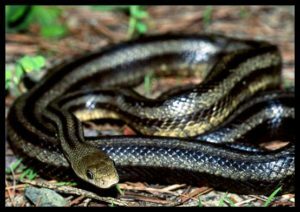 Other snakes cost hundreds, and even thousands, of dollars! 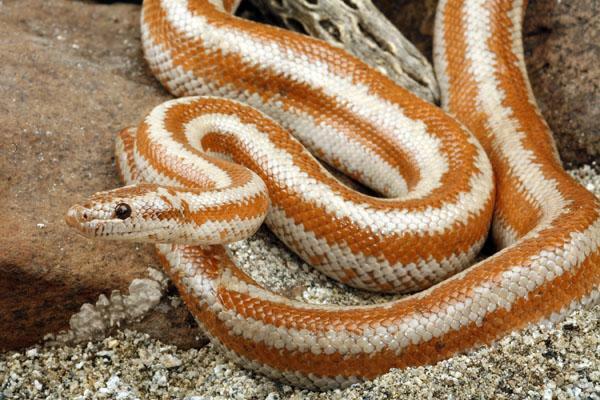 Also, rosy boas’ temperaments are perfect for new snake owners and children. They are slow moving, docile and enjoy handling. 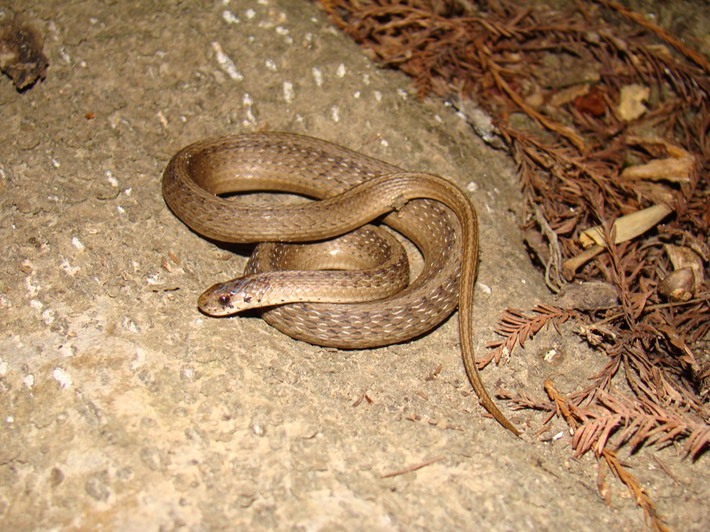 They are also small snakes, even as adults. Their adult lengths are usually 2-3 feet, with very few reaching 4 feet. Their diameter as adults are around the size of a golf ball. 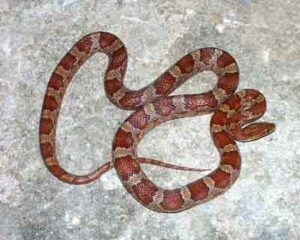 Rosy boas are found in the Southwestern United States and Northwestern Mexico. They live in rocky places where they can hide under rocks. It is best to buy a captive-bred snake for a couple of reasons. 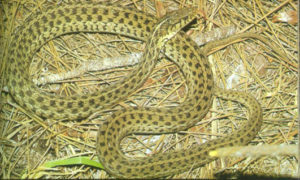 First, if you buy a wild-caught snake their temperament won’t be like a captive-bred snake that was handled from birth. It may also have parasites and injuries. 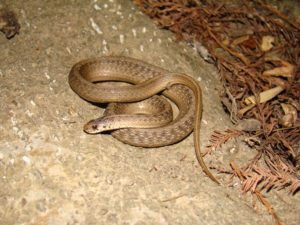 Even if a wild-caught rosy boa didn’t have any such issues, if too many of them are taken from the wild there could be a potential problem with population. It is best to purchase snakes from breeders who know about the individual snake, its parents, and any issues it might have. Breeders should also let you know if they have any concerns about the snakes. 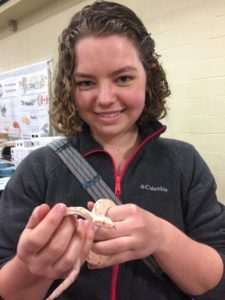 They should be able to tell you how the snake is with eating and handling, and what the snake’s enclosure will need for your snake to thrive. Because rosy boas are small, their enclosures don’t need to be large. Adults do very well in 20 gallon tanks, which are usually 24 x 13 x 13 inches. 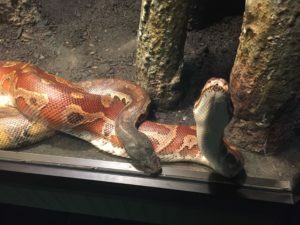 The enclosure needs to be escape proof because rosy boas are known for trying to escape. 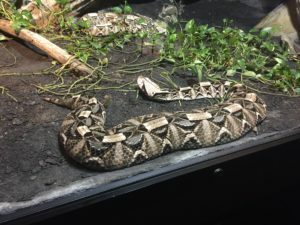 The top should be made out of a specific kind of screen, because the snake may try to escape and injure itself if it’s too rough or the holds in the screen are too large. Instead, the top should be made out of a softer screen with smaller openings. 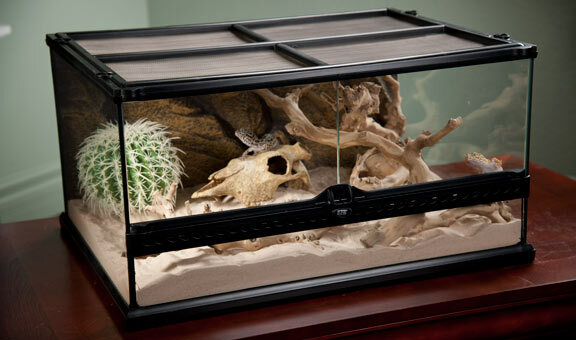 This tank would be an ideal tank (minus the cactus and leopard gecko; never house snakes with your other pets). This tank is selling for about $170, but it is also possible to build your own tank with a kit for less money. All snakes need something called substrate. Substrate is the material on the floor of the enclosure. Substrate can be wood chips, sand, and many other things. 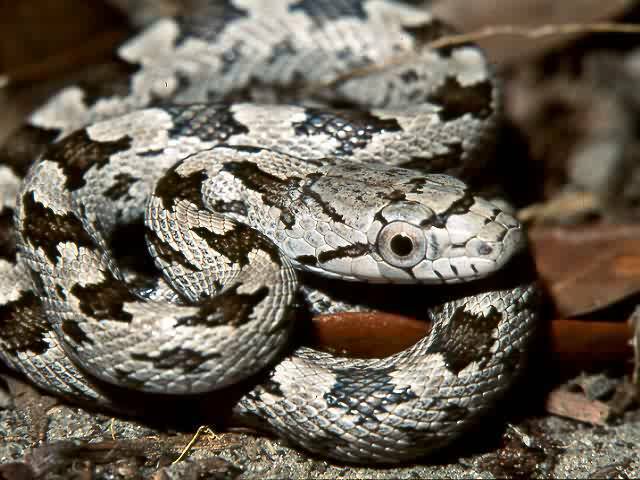 The substrate you choose should depend on the type of snake you have and what it needs. Different substrates contribute different things to the humidity, heat, and comfort level in the enclosure. 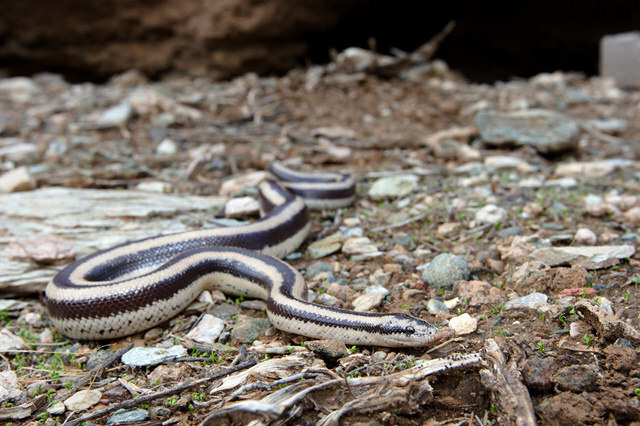 In the rosy boa’s case, it’s best to use newspaper, paper towels, wood chips, or CareFresh. Carefresh is like the bedding for hamsters or other rodents. Substrate should be changed every two months, and immediately if there is any smell. Also, with rosy boas, if any water is spilled in the substrate it should be changed immediately as this can lead to serious health problems. Besides the bimonthly cleanings, spot clean the enclosure 2-3 times per week. Another part of the setup should be hides. Hides can be anything from elaborate little homes and (fake) skulls from the pet store to tissue boxes. Hides make the snakes feel safe. Some snakes like hides better than others, so for some hides aren’t as important. Rosy boas like to have two hides; one on either side of the enclosure. One hide being the warm hide, and one being the cool hide. 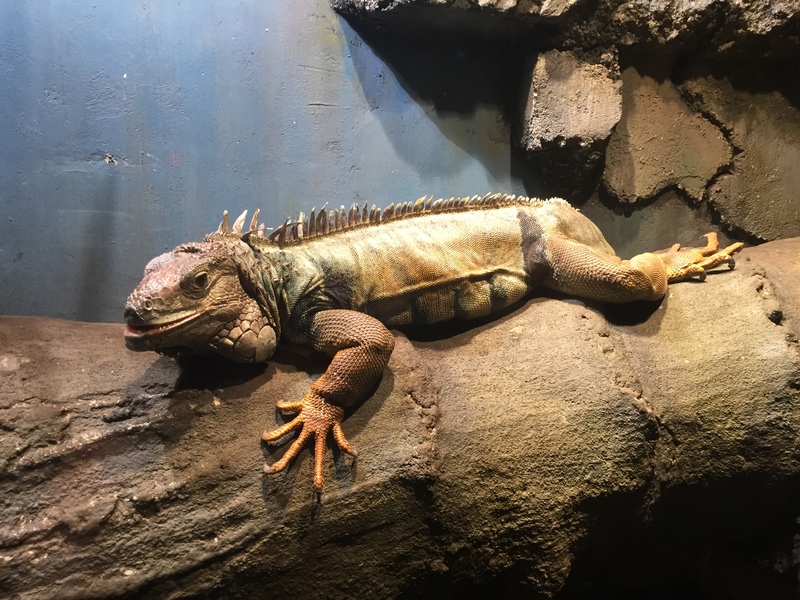 The temperature of the enclosure can be managed by heat tape or a heating pad and thermometers. The gradient of the enclosure should be the low 70s on the cool side and the high 80s on the warm side. Something else very important when it comes to snakes is humidity. Some snakes, like the reticulated python, require very high humidity. Other snakes require very low humidity. Rosy boas are one of the latter. They live in very low humidity areas like deserts, so the humidity of the enclosure should not be more than 60%. If the humidity gets too high, the snake can quickly get respiratory issues. This is very dangerous and can quickly lead to death. 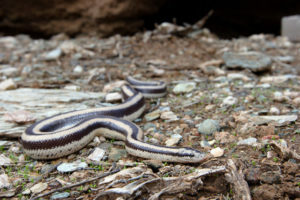 To keep the humidity down for the reasons mentioned above, you shouldn’t give your rosy boa constant access to water. Instead, put a water bowl in for 1 day 1-2 times per month. This way, your rosy boa still has access to water and the humidity won’t reach a dangerous level. 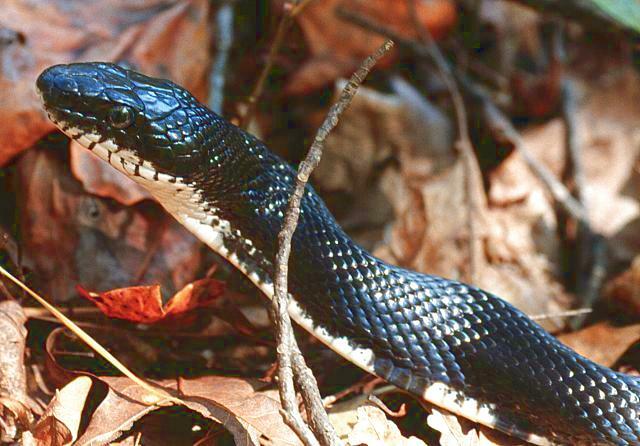 As long as the snake eats well, the snake will stay hydrated from the mixture of biweekly water access and mice. Related to the water is the food. Rosy boas only need to be fed one mouse 2-4 times per month. The age of the mouse will correspond with the size of the snake. Baby rosy boas will eat the baby mice, called pinkies, while adults can eat small adult mice. When you get the mouse, it will be frozen. When it is time for your snake to eat, take the mouse (it will be in plastic packaging) and submerge it in warm water. To make sure the mouse is completely defrosted, squeeze it in the middle. If it is completely soft and you don’t feel anything frozen, it is safe to feed to your snake. 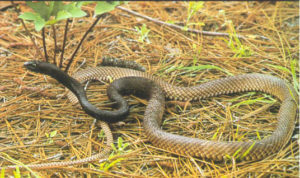 After feeding, snakes should not be handled for two days or until the mouse is no longer visible in the body. If the snake is handled at this point then it may regurgitate the mouse, and nobody wants that. 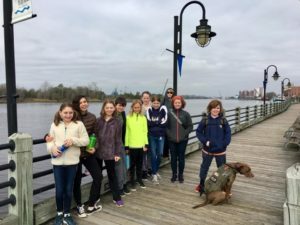 This week I went on a super fun trip with kids ages 12 and up. I’m part of a group where we take turns planning trips with/for the older kids and our latest trip was to a serpentarium in Wilmington, NC. Zack (@zelda) did a great job planning it. We stayed at his grandparents’ condo for two nights and went to the Cape Fear Serpentarium, the beach, the Fort Fisher Aquarium, Fort Fisher, and a couple of little shops near the condo. Left to right: Kate, Liberty, Elisha, Caleb, Andrew, Ireland, Jordan, Zack, Me, Will, and Ralphie. 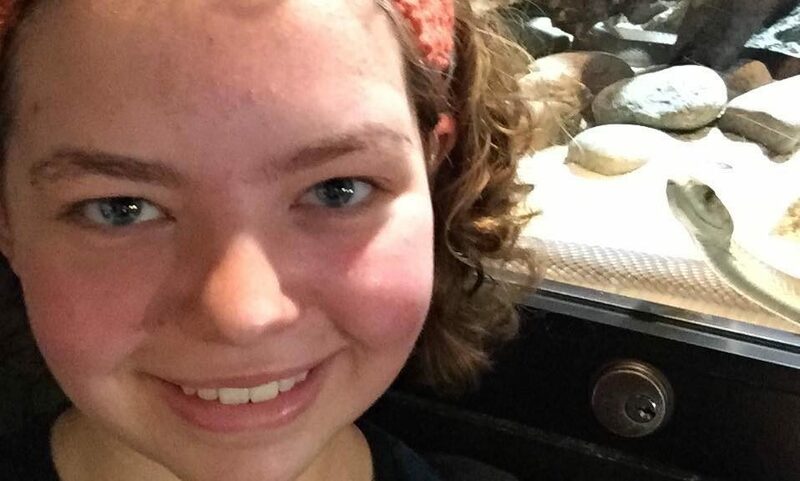 A serpentarium is like a museum/zoo that shows snakes, lizards, and other reptiles. We went to the Cape Fear Serpentarium which, according to the website, has the largest and most rare venomous snake collection in the country. It was so amazing! I saw so many different types of snakes, including a black mamba (pictured) that either liked me or wanted to eat me. It was really cool to see a black mamba because when I was younger I was super interested in them and re watched a documentary about them probably five times. I felt proud of myself for knowing what kind of snake it was before looking at the sign. 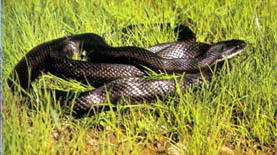 Black mambas are extremely venomous (5/5 on the venom scale) and their bites are known as the kiss of death. This snake is so cool because it looks like leaves. Liberty and me at the aquarium. 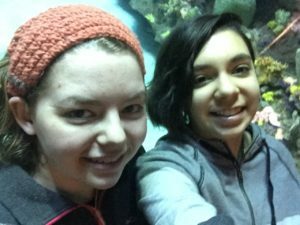 We also went to the Fort Fisher Aquarium. That was a lot of fun. We saw a dive show where two scuba divers went into a huge tank with fish, sharks, turtles, and an eel and answered questions through an underwater walkie talkie system that we could hear outside the tank. 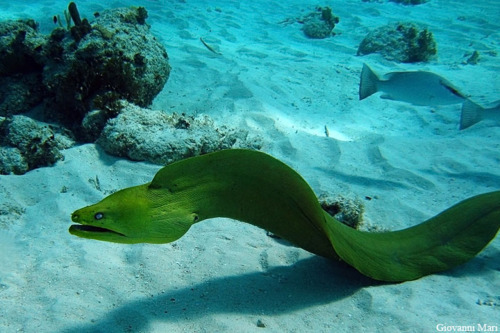 We learned that green moray eels (pictured below) aren’t actually green. They’re blue, but the slime they secrete everywhere is yellow making them appear green! I thought that was super cool. Something the Fort Fisher Aquarium is famous for is Luna; their albino alligator. Albino alligators can’t survive in the wild. A big reason is that because they’re albino, they can get sunburns super easily. An alligator’s instinct is to bask in the sun. 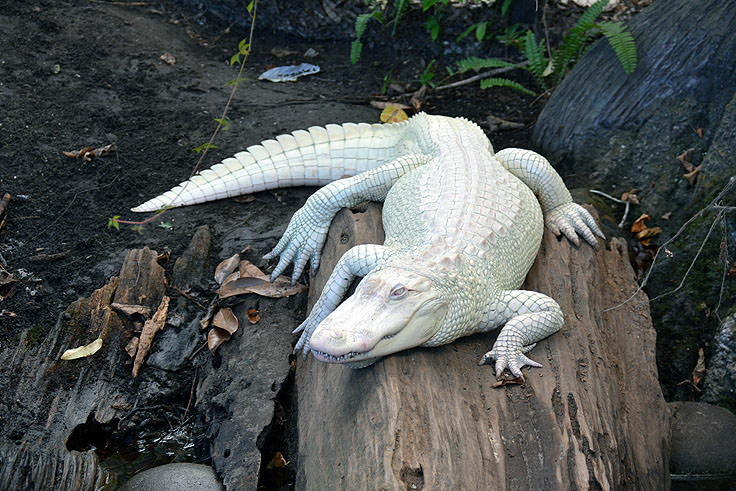 If an albino alligator basked in the sun and did what they wanted for just a couple of weeks, they would probably die from sun poisoning. Unfortunately, we had to go through Fort Fisher really fast. We didn’t have time to read the signs and I don’t really remember anything from the quick movie we watched beforehand. I will say that it was a nice walk around outside and the mounds around the fort were cool, though. I hope you enjoyed reading about my trip. The reason this is so late is because I’m on spring break (Universal Studios!!) and just now had a free few minutes to finish this up. *Not at the Serpentarium, This is at Repticon the Sunday after the trip. 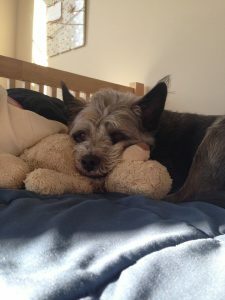 I thought that I would go through all of my blog posts from the past year and choose my favorite ones to share here. I’ll list them in order from oldest to most recent. Enjoy! Alright. This is technically from a year and six days ago, but there’s no way I’m going to post my best blogs and not post this one. This blog talks about the Balkan war and how it affected Bosnia. We had a parent come in and talk about his experience as a child in Bosnia during this war and his experience living in a refugee camp and then finally coming to America. 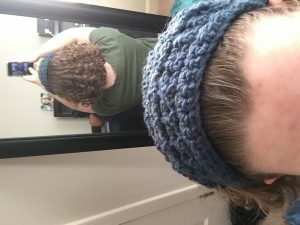 Here, I explain the main idea of the Curly Girl Method. 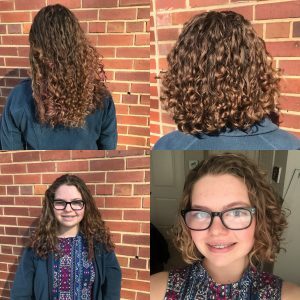 I also have some pictures of my hair’s progress before and during the method. It’s been almost exactly two years since I discovered my hair was curly and I’m never going back! This isn’t my best blog, but I wanted to include it because it shows my art skills about a year ago. I remember that the portraits I drew of this team were harder than the big ones because they were so small! I was super proud of how it turned out but I never did end up getting it autographed. In this post I talk about dominant traits, recessive traits, alleles, heterozygous, and homozygous through the use of punnet squares. I also show how traits can skip generations in hiding because they were recessive, then show up later when paired with the same recessive trait. This post might be a little confusing in some parts, but I did spend a lot of time making sure I used the correct spelling and names. I break down the Kuku rhythm and how it came to be. I also talk about different types of drums and proper form when drumming. This week I started a new project; transcribing my favorite podcast. I’ve been listening to a podcast called The Hamilcast. It’s about the Broadway musical Hamilton. The host Gillian Pensavalle interviews cast and crew members of Hamilton and other Broadway shows as well as other people in the community. I really love how fun she and her guests are and the questions she asks are always super interesting! Recently I learned that they were asking for help transcribing the podcast for deaf or hard of hearing people and I thought I would help. So far I’ve transcribed a little over half of one of my favorite interviews. I’ve learned that it’s pretty hard! I have to type quickly in order to keep up, figure out how to format it when they interrupt each other, and really listen to make sure I type the correct words. It’s a really relaxing thing to do when the kids I babysit are asleep or before bed. My biggest problem I had when learning how to do this was that sometimes they would talk so fast it would take absolutely forever to type everything out without rewinding every two seconds. I figured out that I can change the speed of the podcast to .5 so that they talk slow, but fast enough for me to understand them better. It’s also entertaining because they sound pretty intoxicated. I’ve managed to survive the Plague (flu season) so far, so that’s good. We had 13 sick people on Tuesday. I can’t wait until this is over. This post is about my newest business venture; crocheted headbands. On Wednesday during Change Up I wanted a fidget, so I started crocheting a scarf. 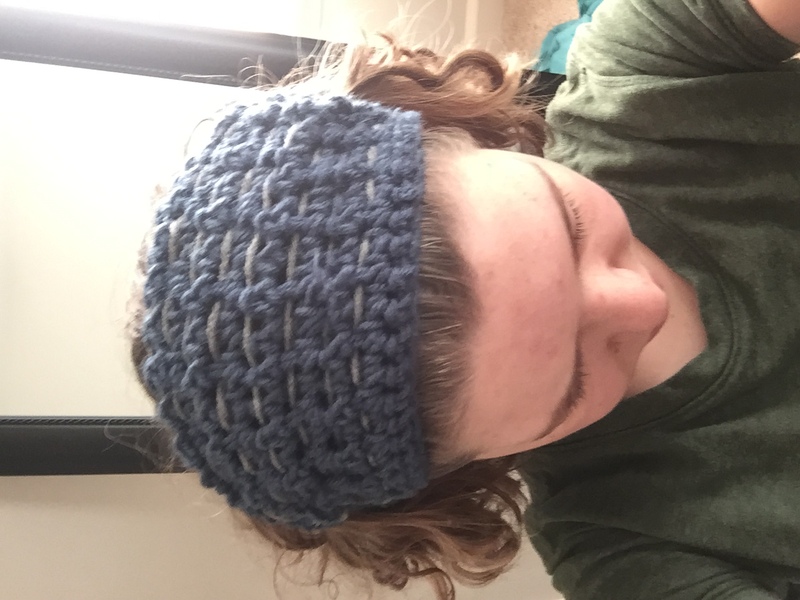 Halfway through I decided to change it into a headband and I made this. I really liked it! I got a lot of compliments and a couple of people asked if I could make them one. That evening I went to Michael’s and got a couple of bales (yes, bales. That’s a thing.) 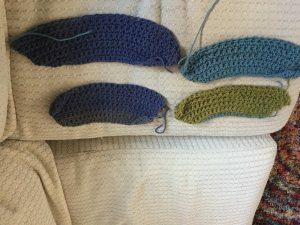 of yarn and the right size crochet hook. I’ve been making them almost constantly now when I don’t have an offering or meeting. 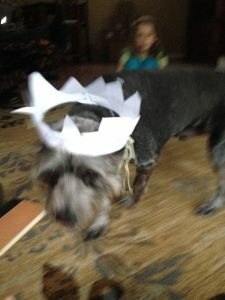 I’ve given a few away to Grayson, Nancy, Elisha, Tessa, and my mom, but now I’m going to start selling them for $7 each. I texted my Grandma to decide on a price because she knows a lot about pricing this sort of thing. I have to go. Bye! This Monday was MLK day. Every year pretty much everybody from school goes Uptown to the different museums offering free or cheap admission to either their usual exhibit or a special event. Last year I went to the Harvey Gannt Center and this year I went to the Levine Museum of the New South. I really like the Levine, but I’ve been so many times that it’s a little bit boring. I really like how instead of not being able to touch anything, you can feel cotton in different stages and be in a barber shop or appliance store from the mid 1900s. In between the little shops and activities there is a lot of information mostly about segregation/desegregation, what working was like for poor Americans, and how Charlotte (and the area surrounding) has changed over the years. Even though I’ve been so many times, I always notice little things I hadn’t before. Like the two black boys, aged 8 and 10, were put in jail for kissing a white girl their age. I also saw a picture of the redlining done. Redlining is where the government decides which kids go to which schools because of their race and/or socioeconomic status. Instead of drawing clean lines that make sense, they would move them all weird so that the kids of color all went to one school. Then, they would give way more money to the white schools than the other ones. I didn’t learn this at the museum, but I did learn this recently. It’s kind of like (or maybe it is) redlining. The neighborhoods were numbered 1 2 3 and 4. 1 being the whitest and richest and 4 being the poorest and non-whitest. My dad looked it up and our neighborhood used to be a 4. It’s crazy to know how much the area has changed! This week we had a crazy (crazy for where we are) snow so school was cancelled Wednesday and Thursday. On Wednesday Elisha and I went out and played a lot but yesterday it wasn’t as tempting. It had started to melt and we experienced it enough the day before. We started to make a snowman, but turned it into Dobby the house elf from Harry Potter. It looked really bad. Maybe I’ll add a picture later. Today there’s still quite a lot of snow in the spots where the sun hasn’t shone too much. Balto (my dog) loves the snow most of the time. He likes to run full speed through it when it’s ankle deep but thinks that everything else is just boring and cold. He prefers to sleep in his bed by the fire. 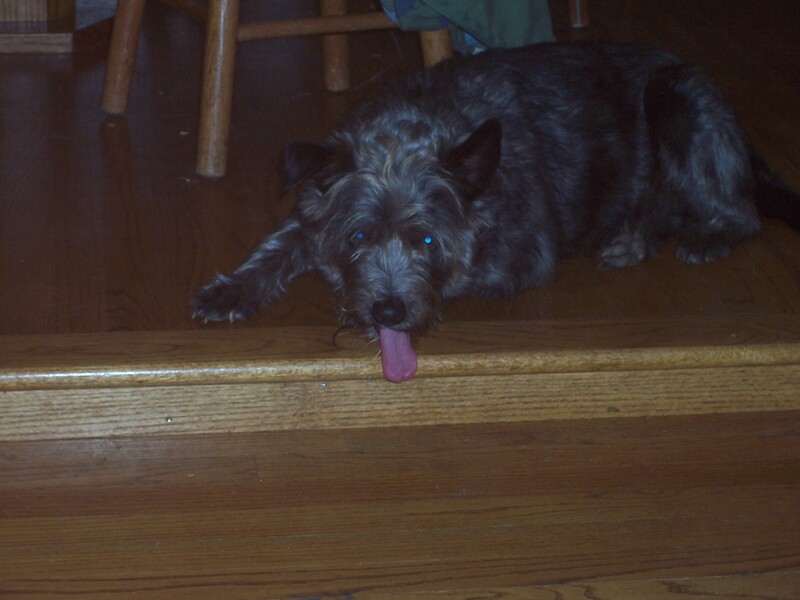 I found this ancient picture of him. Recently I’ve been focusing on learning geometry because I have a test in June. I’ve always taken the EOGs (End Of Grade) for fun, but this year in 9th grade I have to for the state. I’ve been learning geometry on Khan Academy. I really love Khan Academy because the teacher talks to you and demonstrates everything on the screen with a stylus. There are also practice tests that will give you extra videos to help you with what you need to work on. In the past, I always learned about genetics and the circulatory system on Khan, but I’m realizing it’s a great place to learn math as well! My goal is to complete the geometry section of Khan before my test in June. Something else I’ve been doing is working on my knowledge of American History. I got A Young People’s History of the United States by Howard Zinn for Hanukkah. The books starts when America was “discovered” (but not really discovered because people were already here) and goes to sometime after the year 2000. Right now I’m in the early nineteen hundreds. The book is really good (unlike much of the history inside of it)! I like how you see the events from different perspectives. We hear what the rich white people said in addresses and speeches, what the free/enslaved black people said in front of large groups of people or in meetings, and what the middle class wrote in newspapers and pamphlets. There is also an entire chapter dedicated to the activist women in the 1800s. I highly suggest this book (or the original adult book if you want) if you’re interested in American history. One more thing. 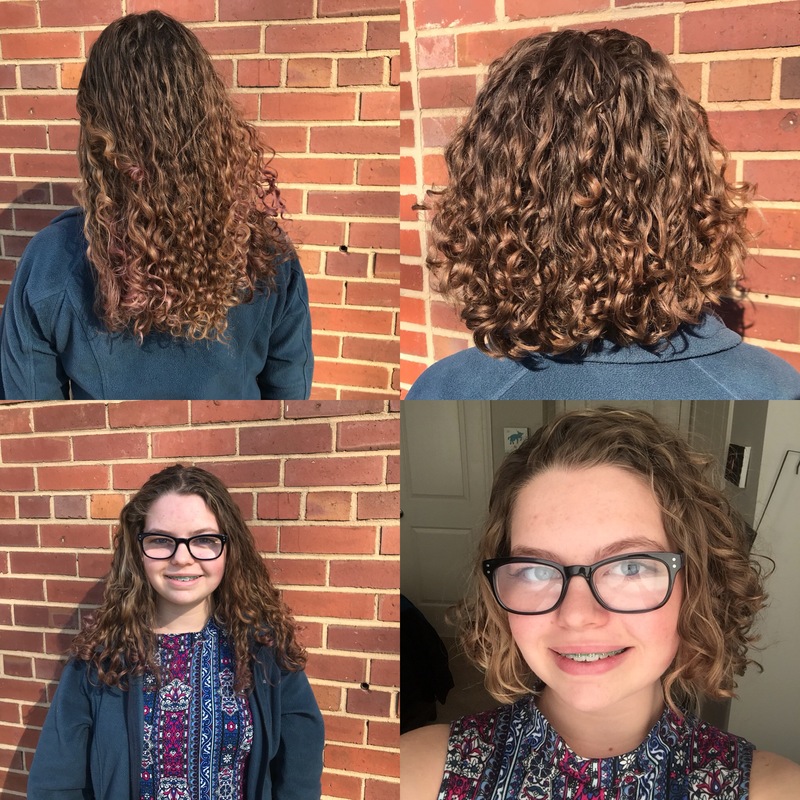 I got a big haircut! Now my hair is the shortest it’s been in ten years.